LANGHORNE, Pa. – The Belmont name will return to the high banks of Daytona International Speedway on Feb. 10 when Andrew Belmont competes in the ARCA Racing Series presented by Menards season opener. Eleven years after his father, former racer, team owner and crew chief Andy Belmont, competed at Daytona, the 25-year-old Andrew Belmont will make his first start at the 2.5-mile superspeedway during the Lucas Oil 200 driven by General Tire thanks to a partnership with team owner Wayne Hixson. The younger Belmont has made six previous ARCA Racing Series starts, but none since 2010. More recently the 25-year-old Pennsylvania native has been racing modifieds on dirt tracks around Pennsylvania and New Jersey. He got back behind the wheel of an ARCA car during the annual Daytona open test in January when he turned laps in a car prepared by Mullins Racing. The chance to follow in his father’s footsteps by racing at Daytona means a great deal to Andrew Belmont, who is looking forward to the chance to show what he can do. For his father Andy Belmont, who will be working as crew chief for Mullins Racing and driver Willie Mullins during the Daytona ARCA Racing Series opener, the chance to watch his son compete at Daytona is a dream come true. The No. 2 Ford Andrew Belmont will drive will be carrying several familiar sponsors. 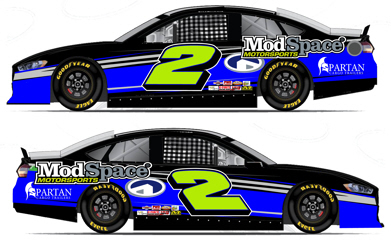 ModSpace, which sponsored the Andy Belmont Racing when the team went to victory lane in 2011 during the Allen Crowe 100 at the Illinois State Fairgrounds in Springfield, Ill., will serve as primary sponsor for the Lucas Oil 200 driven by General Tire. 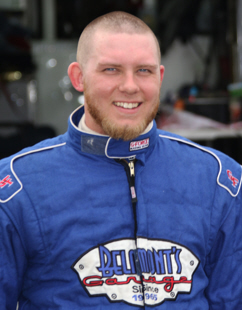 In addition to ModSpace, the car Andrew Belmont will drive will also carry sponsorship from Deka Batteries, Spartan Cargo, ISC Racer Tape, KB Letterin’ Mechanix Wear, Continental Fire & Safety, G Force, LaJoie of Seating and PWD Lubricants. Andrew Belmont said the team, which will be lead by veteran crew chief Tommy Bear, would be happy with a top-15 finish, but the goal is to leave Daytona with the car in one piece.